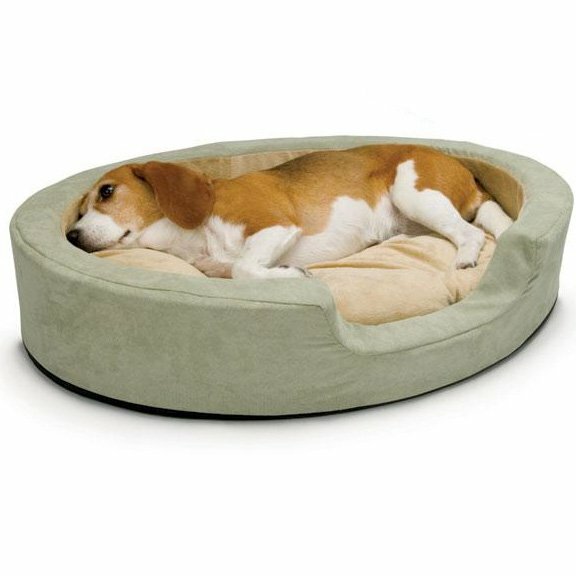 Your dog will stay warm and comfortable all year long with this soft, comfortable heated, dog bed by K and H Manufacturing. Uses little energy and on warms when your dog uses it. Gives your dog the right amount of heat to stay comfortable. Thermo Snuggly Pet Sleeper has different options and/or variations, please choose below. The Thermo Snuggly Sleeper Dog Bed will keep your dog warm and cozy all year long. Bed is designed for indoor use and has two thermostates to keep your dog safely warm. Temperature warms to your dog's body temperature only when your dog uses it. The entire cover is washable and easy to clean. Energy efficient and runs on 6 watts of energy. Heater may be removed and the cover may be washed in the machine. Comes with a one year limited manufacturer's warranty. MET listed. Available in sage/cream or mocha/cream. Medium: 26" x 20" x 5.5"
Large: 31" x 24" x 6"